Yesterday at 20:40 Dave Macleod was sat on top of St John's Head having just completed the first ascent of Longhope Direct. The full route, at 500m, took Dave and Andy just under 10 hours to complete. 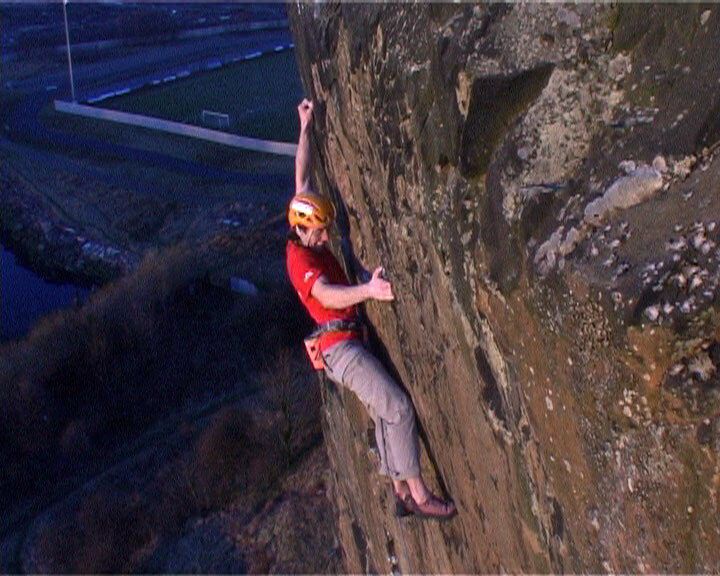 When asked about the grade, an elated Dave said that he isn't entirely sure just yet, but knows that it's definitely harder than Rhapsody (E11 7a), the route he climbed at Dumbarton Rock in 2006. 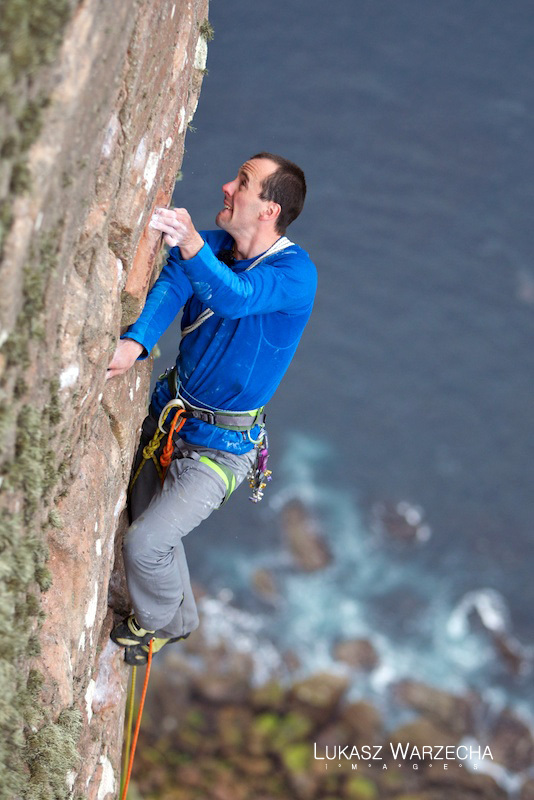 Upon hearing the news, Jon Arran stated that: "I find it incredible that this route has seen only three ascents in over 40 years and has never been repeated (or even attempted?) in the style of the previous ascent." He continued to explain that the route was first climbed by Drummond and Hill using any means available to complete the route. After that the face went unclimbed for 27 years until Arran and Turnbull climbed it free, taking a different route between the two arêtes to make for a line that could be more easily free climbed. It is only now, after 14 further years, that Dave has climbed the entire face whilst incorporating the original aid crux in to his line. 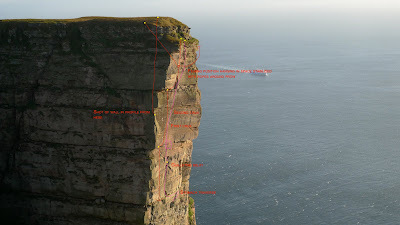 The route itself is fairly inaccessible, with access to the bottom of the line involving a 400 metre descent through a fulmar infested gully on steep overgrown terrain. It becomes even more daunting when you consider that working the 8b+ crux pitch involves shunting on an overhang suspended 400 metres above the rocks below. When you also factor in the inaccessibility of St John's Head (a pathless, heather infested moorland covered in dive bombing bonxies) it becomes clear that any line on the face is inevitably going to be a real adventure. Dave has been taking trips to Hoy for a while with the aim of working Longhope Direct, and yesterday was the first time he had linked the pitches together. Dave has just posted a detailed account of his ascent on his blog, and has stated that what he wanted from the route was a "super hard long route that was bold, loose, birdy, hard to climb in a day - as pure as possible." 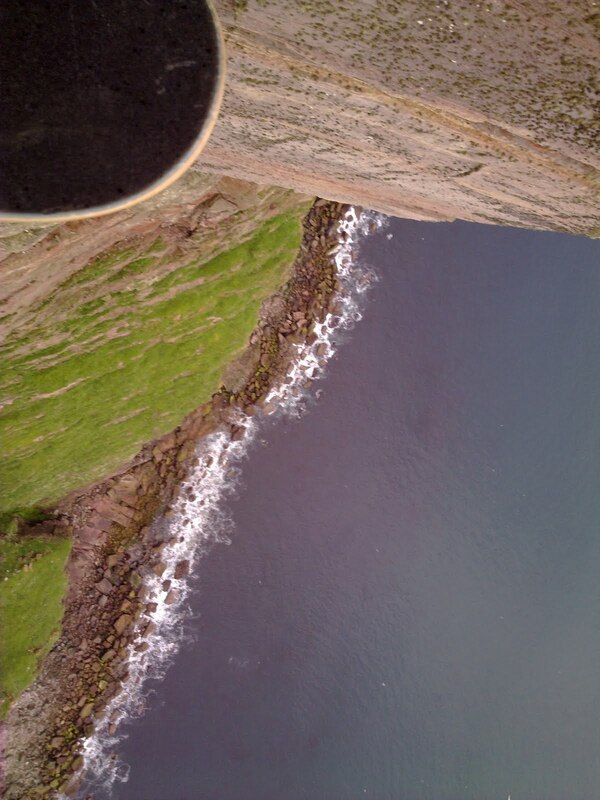 He says that "that’s absolutely what Scottish sea cliff climbing is about." 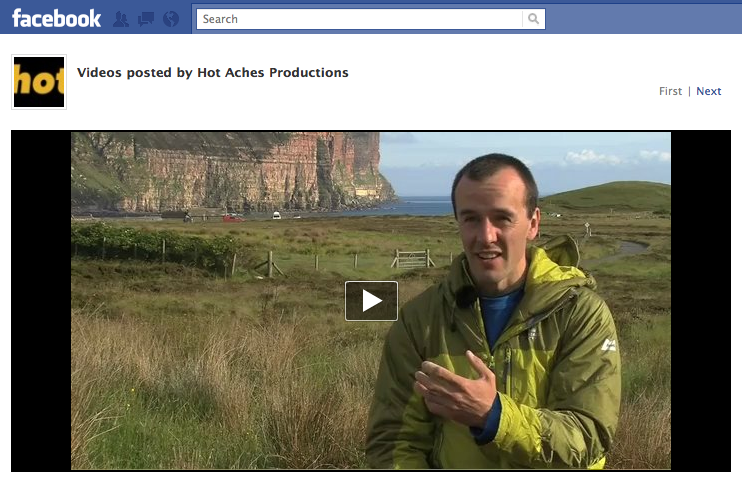 A video of Diff filming on ropes on the crux pitch can be seen on the Hot Aches Facebook page. The ascent is currently being discussed on the UKC forums. Hi, I'm Matt Pycroft and I'm working on the Hoy shoot as a cameraman. I've put a quick post together to show you what's been going on since we arrived on the island. Well the first few days on Hoy have been pretty exciting. 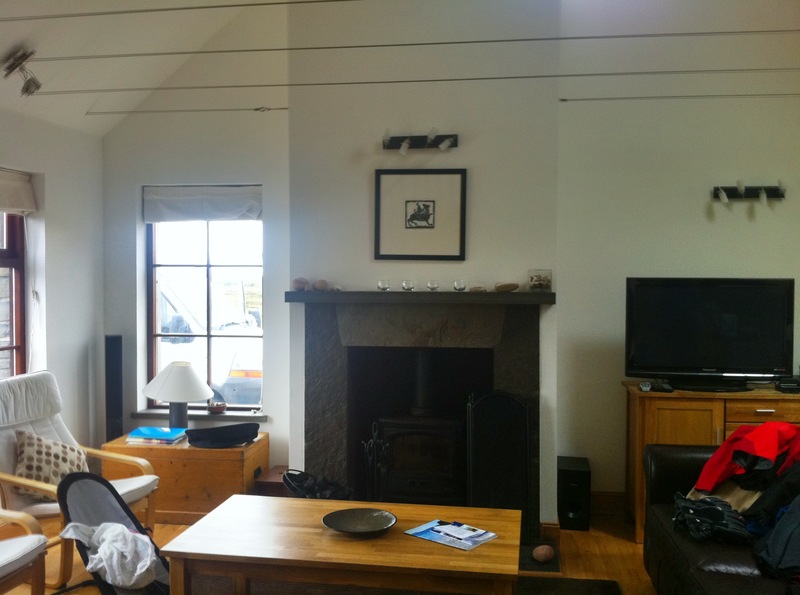 The ‘ME cottage’ we are staying in is really swish, and is by no means the rundown bothy I was expecting. After arriving on Thursday night we packed our bags and grabbed a few hours sleep before heading out towards the crag on Friday morning. Between us we have a huge amount of kit, and as a result the walk in on Friday morning was a painful one when coupled with the initial section involving 400m of height gain on 45 degree terrain. Once we had made it to the coast, Diff and I shot some footage of Dave and Andy arriving at the crag, as well as capturing the moment where Andy saw the route for the first time. 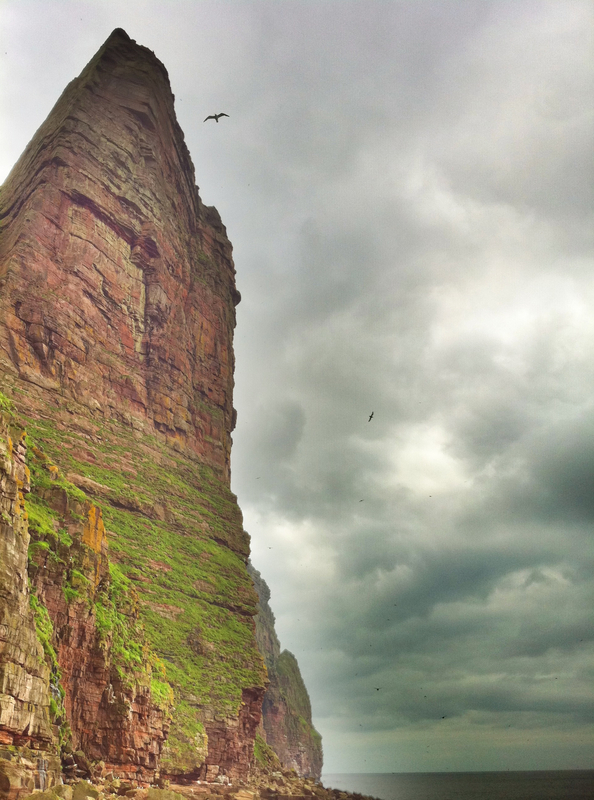 The crag is the biggest continuous sea cliff in Britain, and is an incredibly imposing piece of rock. From the promontory where I will be shooting some of my wide shots the line looks extremely impressive. Diff, Guy, Lukasz and I spent much of the day scouting out shooting locations and angles, whilst Dave and Andy checked out the route and had one last look at the moves (which, incidentally, was Andy’s first chance to catch a glimpse of the line close up). 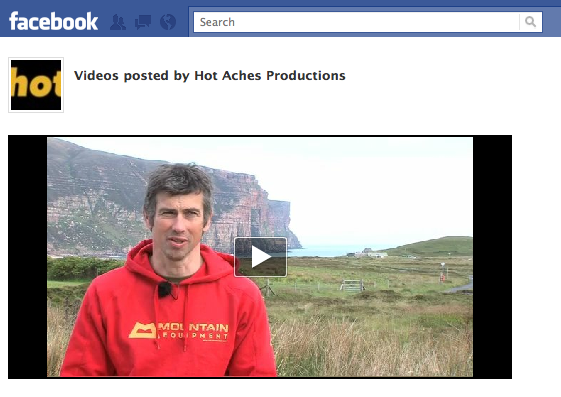 Hoy shoot - Behind the scenes from Hot Aches Productions on Vimeo. As everyone became confident that they were ready for the shoot, people started to filter off back to the ME cottage to sort out gear and pack bags. It got to around 10pm and eventually it was just Dave and I left at the crag. After sorting out our gear we headed off towards the car. The sunset was stunning, and considering the crag is West facing it made for some great footage as we walked out. 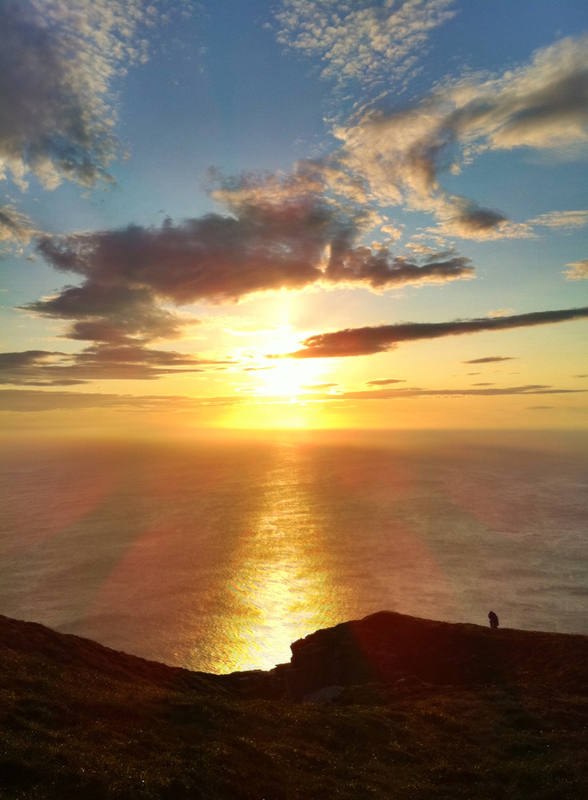 Sunset over Hoy. Hard to beat. We spent Saturday just chilling out and resting to be fully prepared for the shoot today (Sunday), but unfortunately we woke up this morning to an island coated in drizzly mist. Dave and Andy reluctantly called it off at around 10am, and we made the decision to head up tomorrow, weather dependant. Dave and Andy, having just called it off. This year's major film project is about to commence. 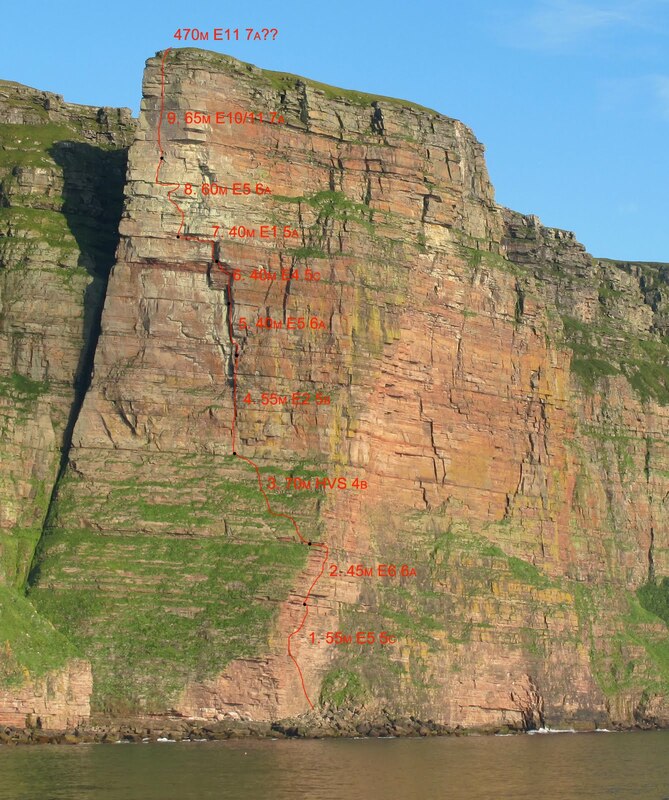 We are shortly heading to the island of Hoy with Dave Macleod and Andy Turner to film an ambitious ascent of the Long Hope Route on St John's Head. But first, a bit of history. 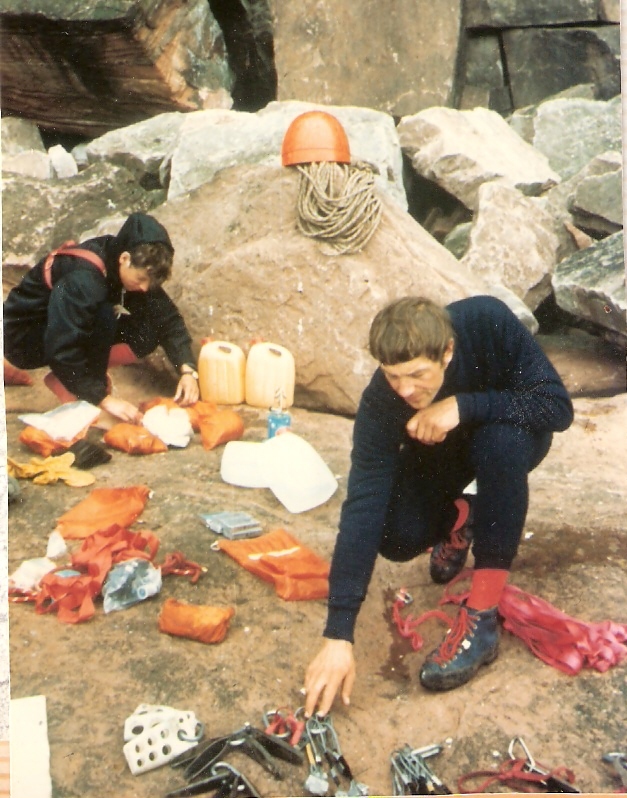 The Long Hope Route was first climbed in 1970 by Ed Drummond and Oliver Hill. They spent 7 days on the wall, sleeping on ledges and in hammocks, and several of the 23 pitches involved some aiding. A first free ascent was made by John Arran and Dave Turnbull in 1997, but this avoided the final pitch up the steep headwall, taking instead a slightly less direct line. Both ascents were landmark achievements for their time, both being onsight and showing real audacity in an unusually inhospitable environment. 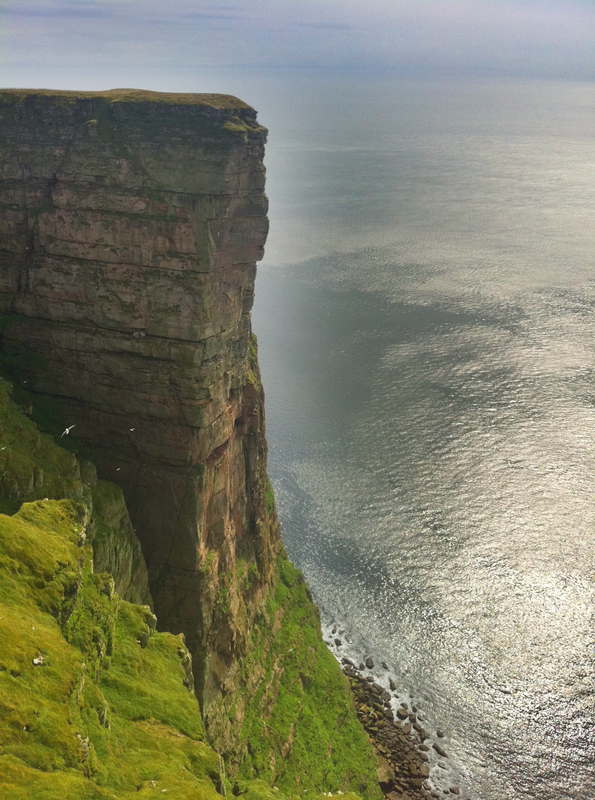 St John's Head is a 1000 feet of sandstone, making it the highest vertical sea cliff in the British Isles. Topo drawn from memory by Oliver Hill, 40 years after the first ascent. 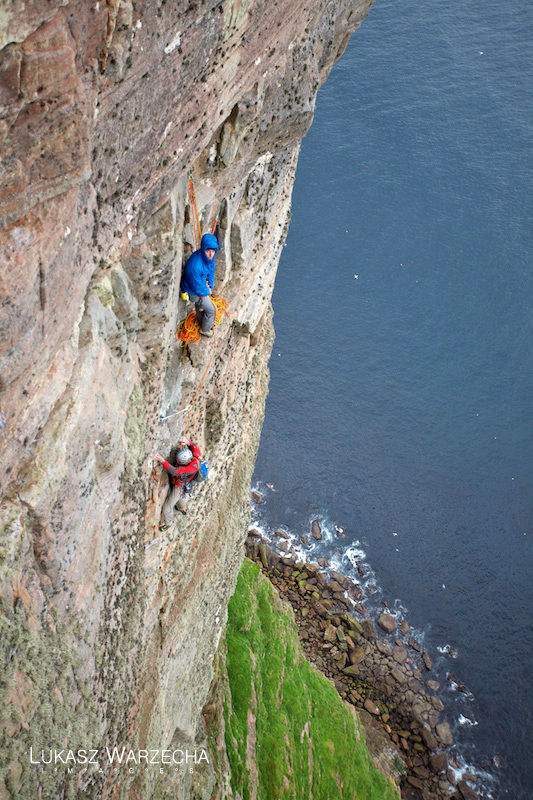 This summer's challenge is for Dave and Andy to climb the Long Hope Route in a single day, freeing the final pitch up the headwall which Dave considers will come in around a hefty F8b+. 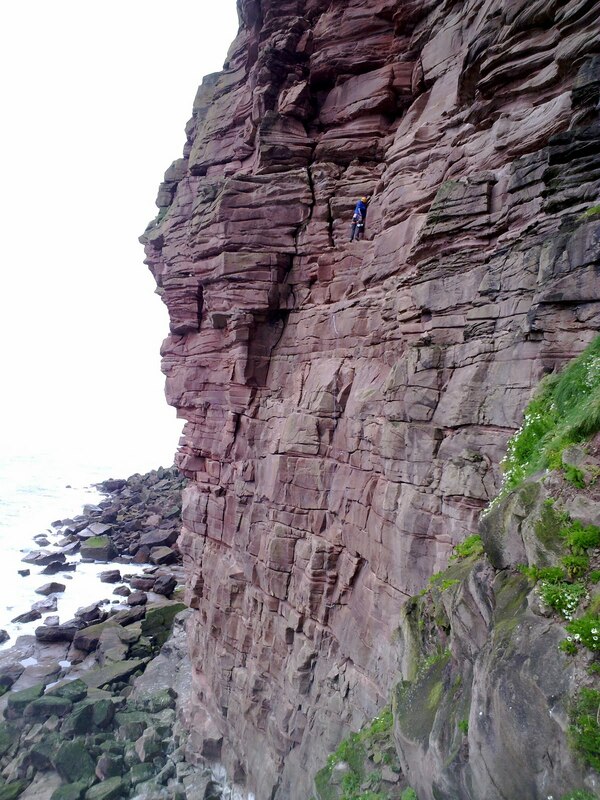 Quite a challenge after 850 feet of sandy sea cliff and several pitches of E5 and above. 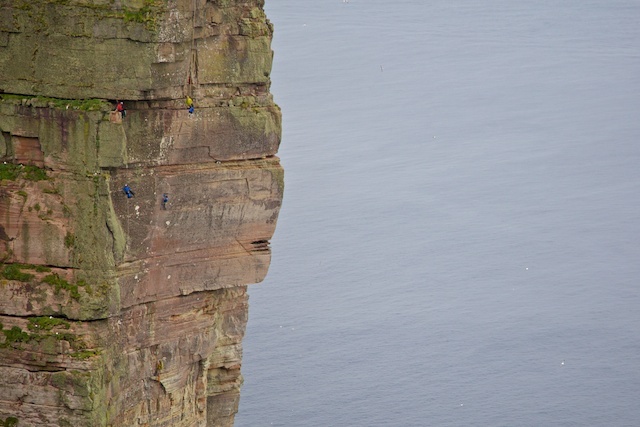 This will certainly make it among the biggest undertakings in British climbing. 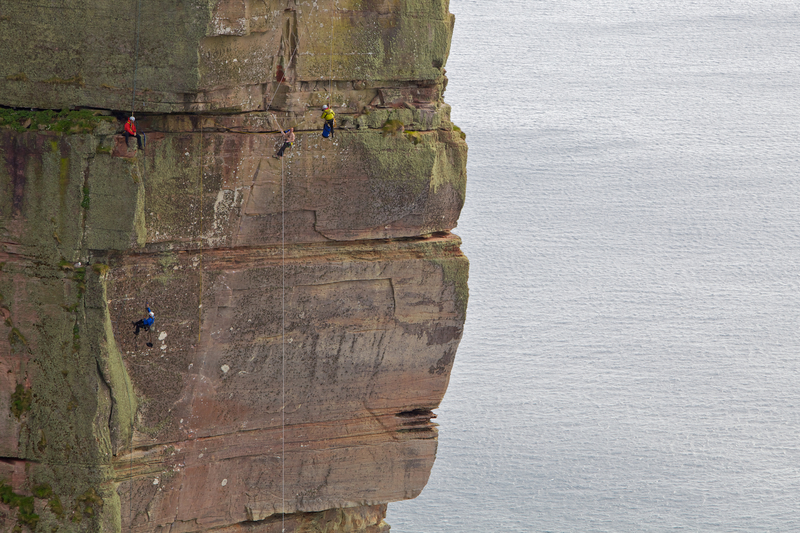 We have already interviewed John Arran, Dave Turnbull and Oliver Hill about their respective experiences on the wall and are privileged to have Ed Drummond joining us on Hoy this summer. 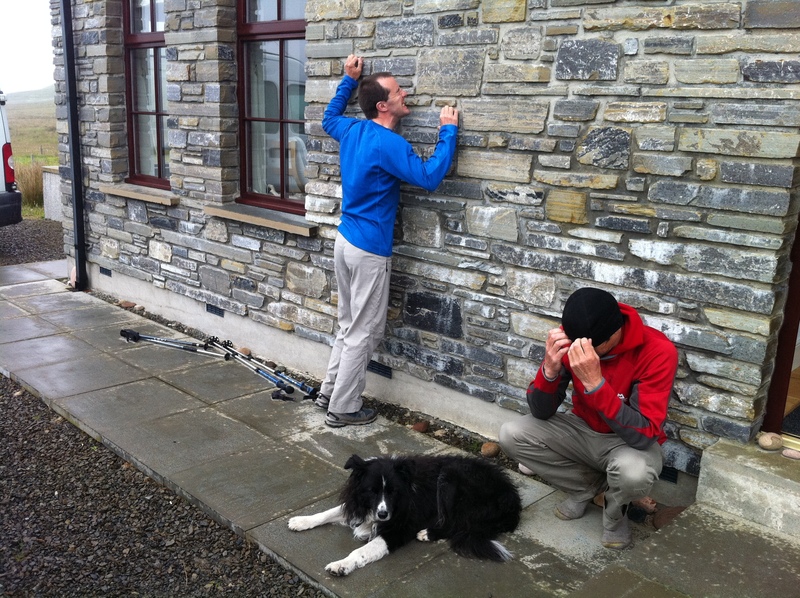 The film will tell the story of the previous ascents as well as Dave and Andy's one-day mission. For those of you who know sea cliffs and particularly sea cliffs on the Northern Isles, the varied challenges will be easily acknowledged. 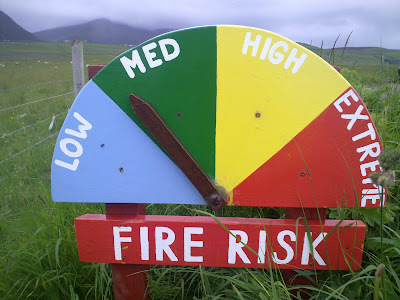 For starters, Orkney seems to have it's own weather system. While here in Edinburgh we might be basking in sunshine, St John's Head might be caught in a raging storm with gale force winds and lashing rain. In June, one needs thermals and Goretex. Having dressed for the weather, one is then left to contend with the wildlife, more specifically, the vomiting fulmars. 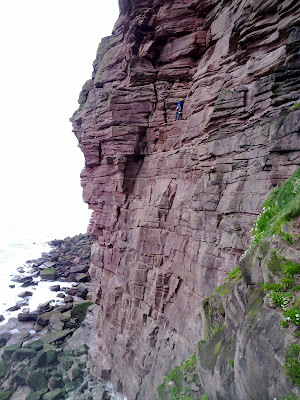 As luck (or nature) would have it, the time when the weather is most clement for climbing coincides nicely with the seabird population reaching maximum density. Not least of the challenges is the approach. First, drive to the very northern tip of mainland Scotland. Then catch two ferries, followed by a stiff 2 hour walk-in and a horrific 1-hour scramble down a treacherously steep, grassy slope.....roadside it is not. Dave at the top of pitch 1. So this year, we're going back with the big guns. 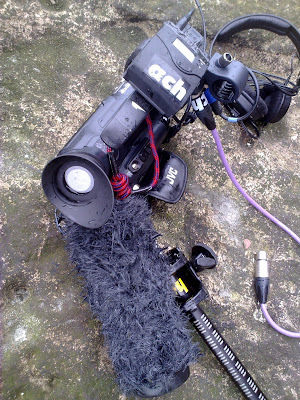 We have much more time, more crew and more film kit than we can possibly carry!! 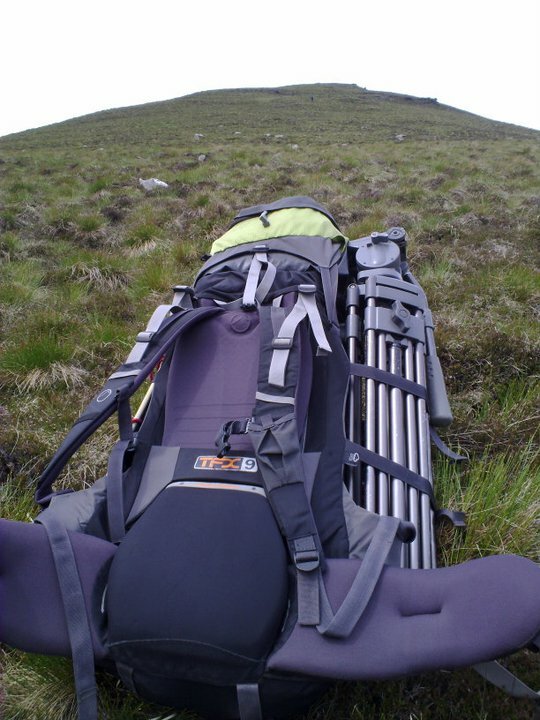 Mountain Equipment are key sponsors of the project and Stoats Porridge Bars will be keeping us well fueled.